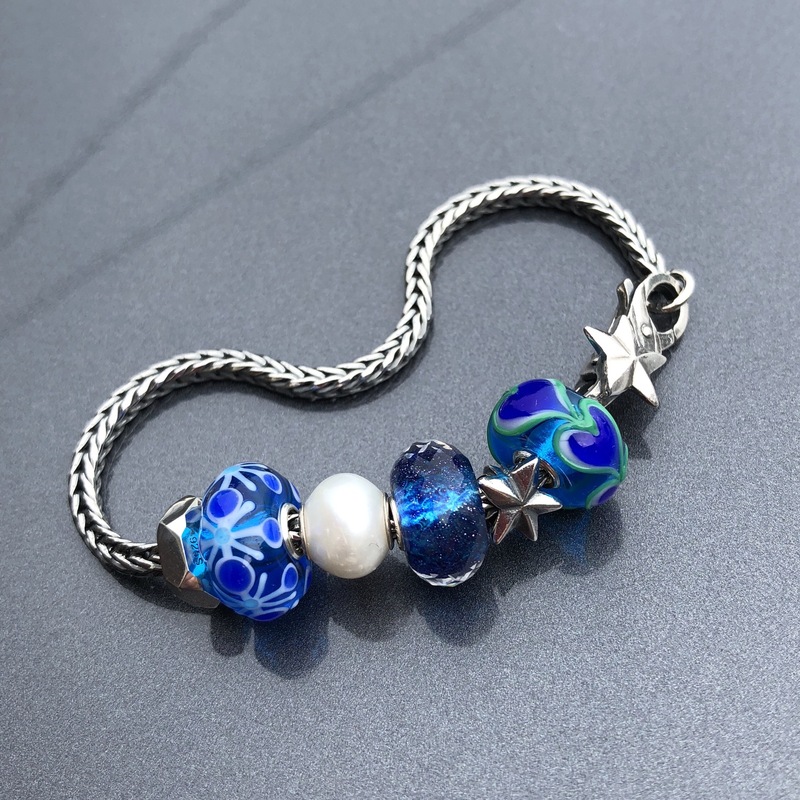 The new limited edition starter bracelet called Wishful Sky will be coming out November 3, for $109 USD/$144 CAD. 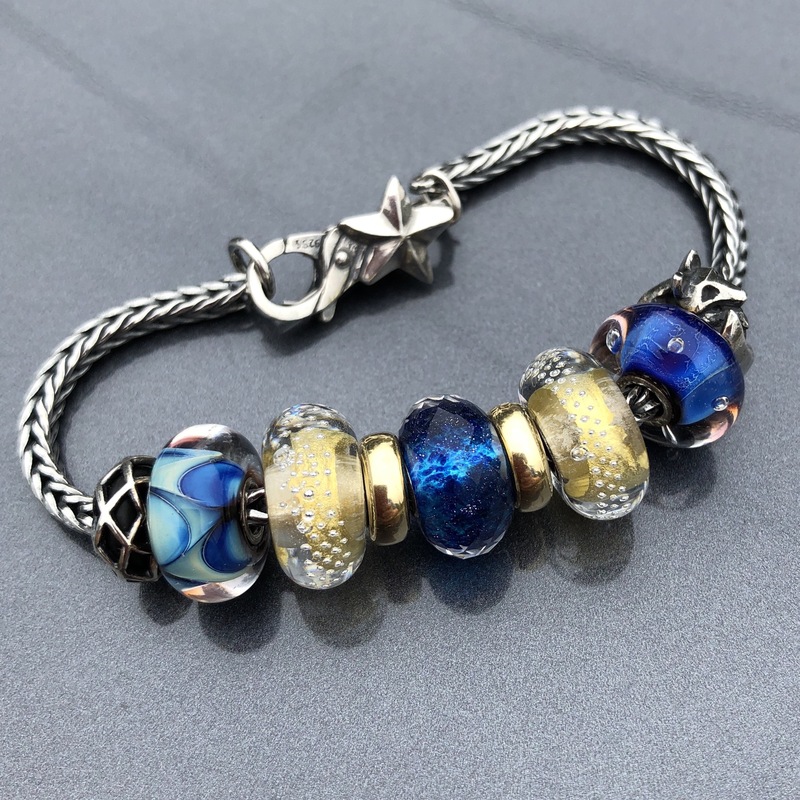 Consisting of a decorative lock, foxtail chain, small silver bead and a blue faceted glass bead, it’s set at a great purchase price. The small silver star is just darling and I absolutely love the back of it! Kyungjin on Instagram mentioned that it looks like a shooting star. To add in a few more beads, I used Gold Spacers, the Diamond Bead in White and a blue bead from the upcoming Winter Forest Kit. There is another blue bead in the Winter Forest Kit and then I added in a pearl, thinking it reminded me of a snowball! The spacer on the left is the Nut Spacer. It’s super shiny! Here I’ve tried adding in a touch of gold with two Gold Spacers and two Gold Silver Trace beads. On the left is the Night Sky Spacer and Wave of Dreams. On the right are The Eye and the Sneaky Fox Spacer. 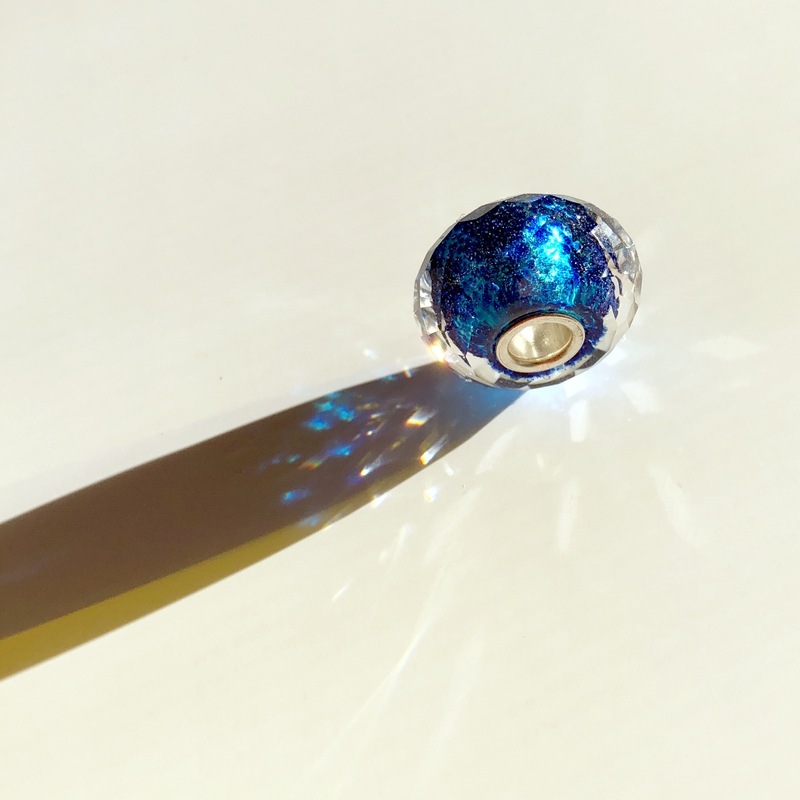 It’s hard to capture the sparkle of this beautiful blue bead and I’m just getting used to a new phone, but I thought a video might be helpful. If an HD button comes up be sure to hit it. 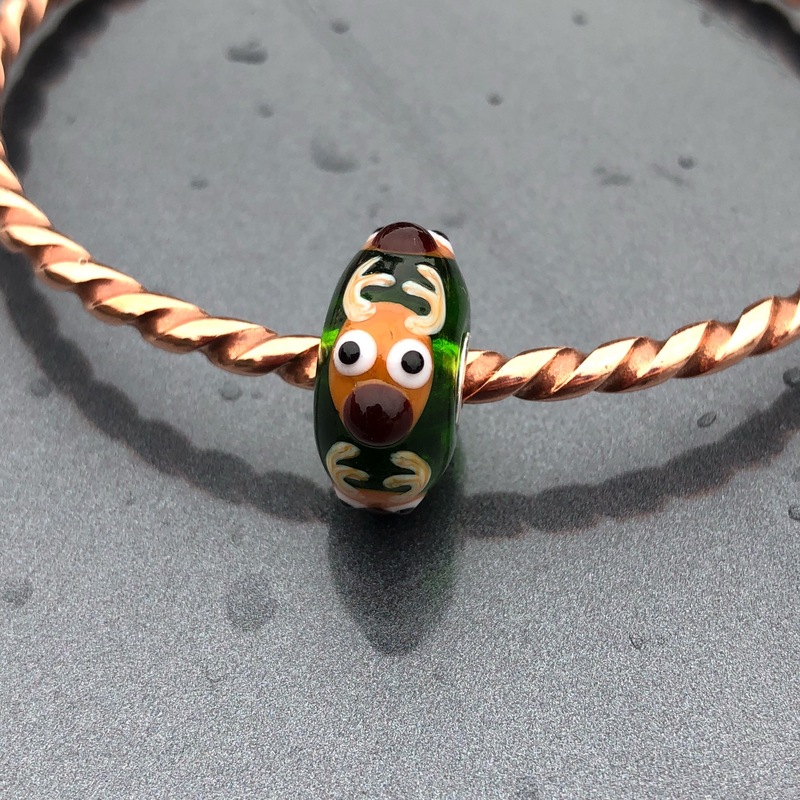 So, hope you’ve enjoyed this quick look at a delightful bracelet! 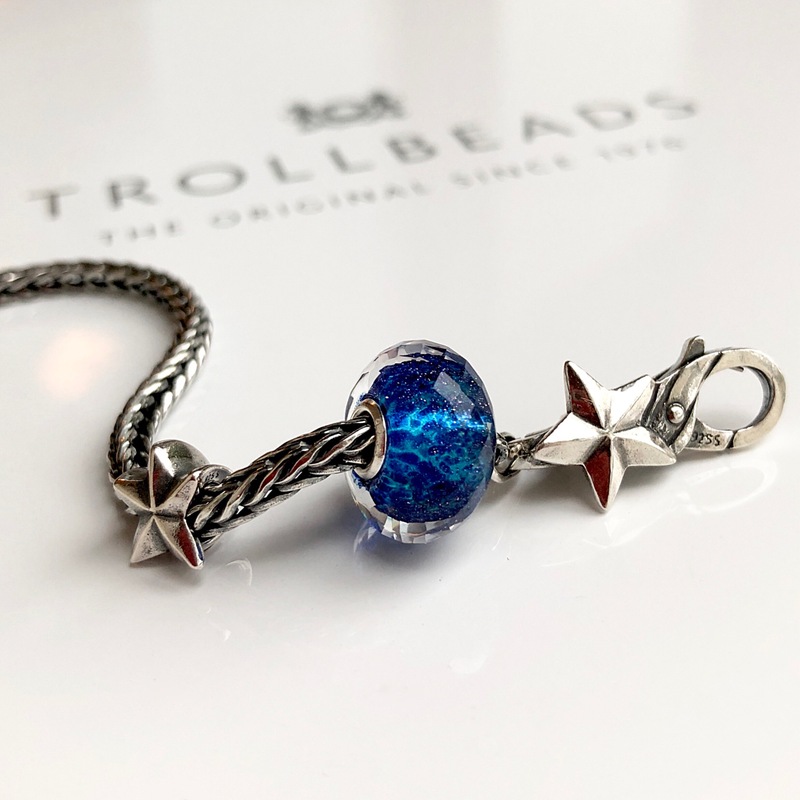 I know lots of people are keen on it and I hope Trollbeads sells lots of them as it’s always my hope that more people get into Trollbeads (and the other brands I love, too!). I asked for this to be in a size a tad smaller than I would usually wear, so that I can just wear it as is, or with only a couple of other beads. These days I’m keeping chains in two sizes, one for full bracelets and one size for smaller, mini bracelets, which I’m more apt to wear daily. I’m going to edit in a photo of the glass bead in the sun if it ever makes an appearance again, but what do you think of it now that you’ve seen live images? Oh! I forgot to mention that here’s a little look at the sweet reindeer! What a cutie! And finally the sun came out! 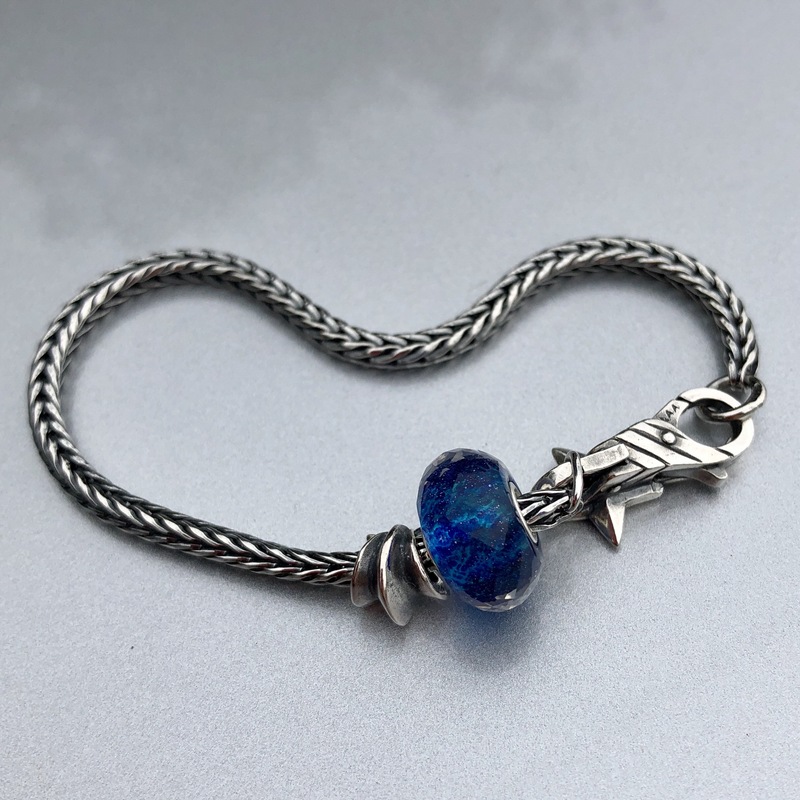 I do hope that Trollbeads will decide to sell this blue glass bead individually. That would allow collectors to get them in pairs easily. It looks especially festive next to the gold spacers. Love everything about this set and there are so many new things that I want from the winter release as well. Pacing myself here – I’m glad I didn’t over-indulge in the fall release! The darker blues of winter look especially striking with white and a hint of gold! Tanya, I feel like I’ve barely dug into the fall release and soon the winter one will be upon us! I also love the darker blues with white and gold. I suspect from the serious collectors we’ll see some stunning bracelets this winter. Hmm, I like that idea of selling the second lock and bracelet. Those alone would make a nice set. You are probably like me-I sometimes say I would do this and that if I won the lottery yet I never buy tickets, LOL! No other bead blogger induces me to buy beads the way you do. I liked this already from the official preview but your video review really cinched it. Starry nights are especially meaningful to me in winter when there aren’t as many other nature things to study. I remember sledding with my kids one night and seeing and hearing a meteor and I will never forget childhood memories of standing in the drive-way with my dad as he pointed out the stars. Sirius is very visible where I live in the winter and I love the way it appears to change colors on really cold nights. I never have been tempted by a set before this bracelet. I am so glad it has been released around Christmas time so that getting it as a gift will be very plausible. Well, thank you for your kind words and I’m so happy that this will be such a meaningful bracelet for you. Isn’t it wonderful how simple objects can take us back in time to remember a special moment. There’s something about a cold, crisp night with no clouds and the vastness of the sky combined with the stars. Thanks for taking the time to comment! Alex, I agree that it would be hard to not like this bracelet, especially at this price point. What a delightful surprise it was to see the back of the silver star! Imagine the blue bead surrounded by Black Onyx with just a touch of gold! That’s a really nice price point (just needs an [overpriced] safety chain), but I personally don’t like the star motif — pointy and generic. I hope that I’m a member of a minority opinion ? At any rate, I’m unlikely to stock up on these for gifting, the way I like to do with starters. My pleasure-sorry it’s not for you. It does seem to be popular, but that’s just an opinion based on nothing scientific at all! Hi Martha, Seeing your video only makes me want this set even more…if that could be possible. I’ve always loved watching the stars…they have a way of calming things for me. 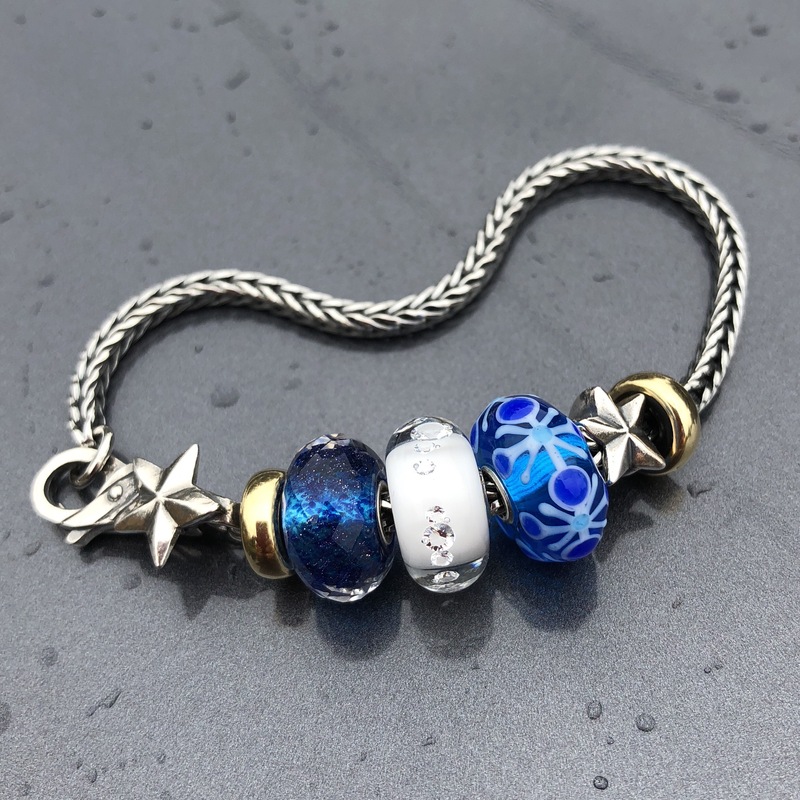 I want to wear this bracelet as is with just a couple of the gold stoppers to complete it. Hi Suzanne! I’m glad you liked the video. It certainly does look good with gold stoppers, I think! I just noticed the glass in the sun! All I can say is💙💙💙💙,etc. Yes-it’s fabulous in the sun! It was gloomy and stormy all weekend so I could not get a photo of it with the sun shining on it. Thanks for pointing out that the star looks like a shooting star!